WJEC C2 May 2015 past paper solutions (unofficial). 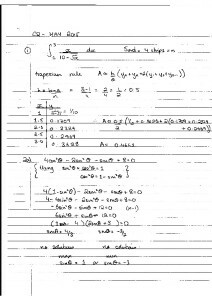 Written solutions and methodology for the C2 paper. The questions for this paper can be found here. The solution to the first question on the c2 may 2015 paper seems to be wrong. Could you please check it? Thanks for raising this, I will double check the answer soon and get back to you. I believe the answer should be 0.4689. I made the error of rounding y values to 4 decimal places.